The studio welcomes new students Kaitlyn Hetsko and May Deischter to the studio. We also welcome Caleb and Joshua Patrick back to the studio; Caleb was a student from 2009-2010 but moved to San Diego last year. It is great to have you back, Caleb! 24 students performed at our Summer Studio Recital on July 2 at The Piano Warehouse Recital Hall in San Marcos: Anna Ingram; Sophie, Thien-Sa and Sam Luyen; JP Roseli; Fiona Harley; Edwin and Elina Kuang; Jason Hu; Emma, Hudson and Hunter Erickson; Nadia and Sonja Muirhead; Andrew Tang; Manuela, Andreas and Joshua Shaefer; Sebastian Mejia; Alexa, Cole and Moises Willis; Hailey Wiltse; Andrew Maravel. 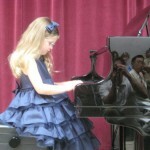 The youngest student was Anna, at 3 years old; one adult student, Manuela, also performed. I am so proud of everyone, especially those that performed for the first time! 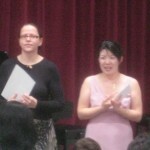 Music Teachers National Association 2-year Music Study Award – Manuela Shaefer – Manuela was my first student in Murrieta, when I moved from Long Island to CA in September 2009. She came to my Murrieta Studio Grand Open Day, and has been a hard-working student ever since! 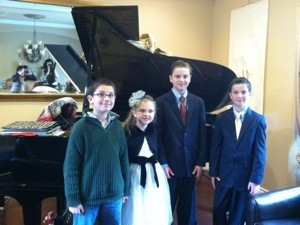 Two of her sons, Joshua and Andreas, are also studying the piano now. Solfege Singing Model – Joshua Shaefer – I teach all young beginners in Solfege and ask that they always sing in Solfege when they play. Joshua started lessons when he was 5 years old, and has been the most conscientious student in this area, consistently singing and counting every note every time he comes to his lessons! He just turned 6 years old, and is sitting his first National Piano Guild Auditions next week, performing an Elementary B National program (10 memorized pieces). Most Improved Student – Emma Erickson – Emma is 5 years old, and started lessons in January this year. She is the youngest student from the studio sitting the National Piano Guild Auditions, performing a 10-piece memorized National Program. She has worked very hard and improved tremendously. Studio Scholarship – Andrew Tang – Andrew has been a very hard working student. 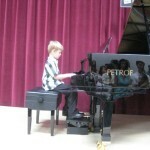 He received Double Gold Medal in the Temecula Music Festival, and is performing an International Program (20 memorized pieces) for the National Piano Guild Auditions. 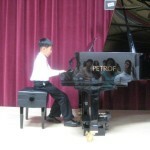 Earlier in June, he participated in the Temecula Young Artist Piano Competition and was awarded 2nd place winner. There were 20 participants in his age group, and everyone was absolutely amazing. Andrew also plays the Clarinet and has recently been accepted into the Inland Valley Youth Orchestra. I will award studio scholarships to deserving students. To qualify, the student must register for either 45 min or 60 min weekly lessons, participate in studio recitals as well as two other outside events, and score a minimum of 30 Commendations at National Piano Guild Auditions (other achievements of similar standard will also be considered). The value of the scholarship is $10 off monthly tuition for 45 min lessons, or $20 off monthly tuition for 60 min lessons, for one year. To be considered for Studio Scholarship, please email Yiyi. 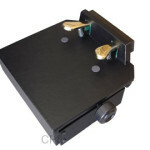 The studio has recently acquired two new equipments: the pedal extender and Blue Yeti Pro professional USB microphone. The pedal extender will allow younger students to start using the pedals correctly, and the Yeti Pro will give a more professional recording sound for making student audition CDs. 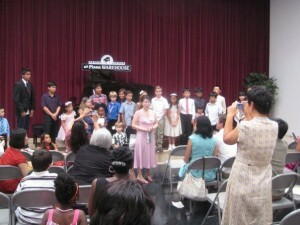 Registrations are now open for 2011-2012 school year. All students intending to return to lessons must register online using the new studio registration form to create an account with a password. If you are taking summer break in addition to the two-week studio break (July 17-31), remember I may not be able to hold your current lesson time if another student needs it. Weekdays from 3:30-6:30pm are highly desirable time slots, and students who continue lessons over the summer will be given first preference when choosing new lesson times for Fall. For students who are advancing into intermediate levels or beyond, or who wish to advance more quickly, please consider registering for longer lesson time frames. This is necessary as the repertoire becomes longer and more substantial. I have invested a lot of my personal time in giving extended lessons during the first year that I relocated my studio to Murrieta; my current schedule no longer allows that, and students who need the extra time must register accordingly. Remember, your tuition not only covers the actual lesson time, but also my personal time spent thinking about each particular student, sourcing and developing appropriate teaching materials, acquiring and maintaing studio equipments, attending student performance and assessment events, maintaining professional memberships and certifications, and undergoing professional developments. I do value each and every one of my students, and l believe that all my students benefit from being part of a vibrant studio. Have a great summer, everyone, and I look forward to seeing you after the studio break!